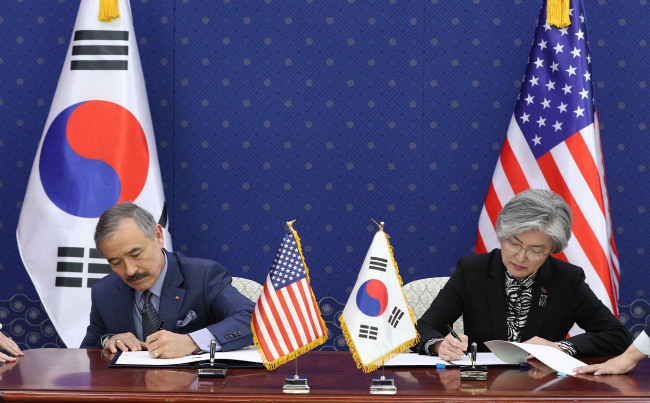 South Korea and the United States signed a formal agreement Friday, which calls for an 8.2 percent hike in Seoul's share of the cost of stationing American troops here. The two sides agreed that the signing of the Special Measures Agreement, a fruit of tough negotiations, reflects their robust alliance. "This now becomes the foundation of -- one of the foundations of -- the alliance, and something that the alliance will build upon to become stronger and greater," Kang told Washington's top envoy in Seoul, Harry Harris, after the signing ceremony for the SMA in Seoul. Last month, South Korea agreed to pay 1.04 trillion won ($920 million) in 2019 for the operation of the 28,500-strong US Forces Korea, up from 960 billion won the previous year. Harris agreed that the accord represents the significance of the alliance. "It underscores the importance and the ironclad nature of our alliance between our two great nations that have worked together and represents the sacrifices of Koreans and Americans over the decades," he said. The USFK Commander Gen. Robert Abrams said South Korea is an "exemplary ally" of his country. "The signing of this Special Measures Agreement is a clear signal of this strength of the ironclad nature of our alliance," he said. The minister pointed out that it's a result of "hard work and sometimes difficult work." The allies had ten rounds of talks throughout last year, led by veteran diplomats -- Chang Won-sam and Timothy Betts. But they failed to reach a compromise mainly due to differences over the total amount of Seoul's contribution, with the previous contract, signed in 2014, expiring at the end of 2018. They continued negotiations through diplomatic channels for the agreement. The South Korean government has completed related administrative procedures with the signing of the pact, which followed the Cabinet approval earlier this week. It plans to submit the accord to the National Assembly next week for ratification with the aim of putting it into effect in April. The US does not need congressional ratification of the SMA. Now that the agreement will be valid only one year, the two sides will soon have to begin a new round of negotiations on splitting the USFK costs.